At the original Michelangelo restaurant in SLC, they used to serve a pasta dish that was similar to this one and that I tried to recreate at home. This is a really nice, light pasta dish that’s perfect for a spring meal. And it’s a great way to use up some of the arugula from the garden. Cook the pasta in a large pot of salted water, per package directions, until just al dente. Drain the pasta and set aside. In a large skillet, heat the olive oil over medium heat. Add the shallots and garlic and saute for a couple of minutes, until translucent. Add the red-chili flakes and white wine and bring to a simmer, cooking until the liquid reduces by about half — approximately five minutes. Add the shrimp to the skillet and cook until just pink, a couple of minutes. 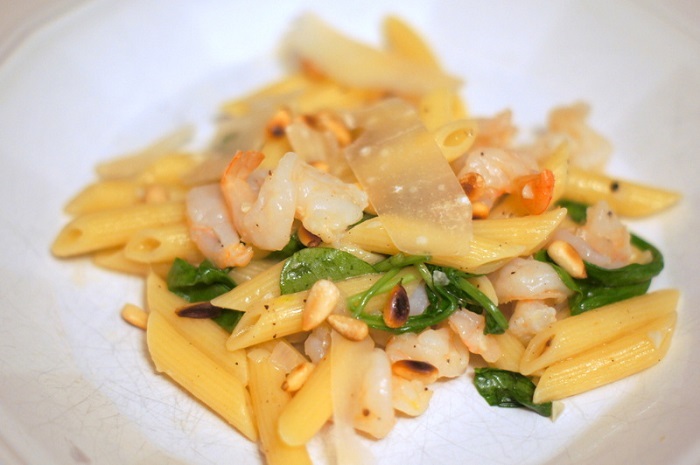 Put the pasta back into the large cooking pot, along with the shrimp and shallot mixture and the arugula. Toss to blend well and season to taste with salt and pepper. Serve the pasta garnished with pine nuts and shaved pieces of Parmigiano-Reggiano.